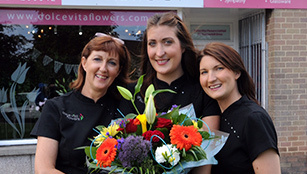 When the team at Dolce Vita Flowers in Aberdeen invested in a Direct2florist website - www.dolcevitaflowers.com - they had high hopes. But little did they know just how much business the site would generate for them. After investing £350 + VAT in the site set-up and £5 + VAT per month to cover ongoing costs of hosting, domain name registration and support, the e-commerce enabled site is on course to bring £17,000 worth of business to the busy florist. When asked what the secret of the Dolce Vita’s site is, Ande answers: “I think it helps that I try to go on and update it regularly. I like to mix things up, change the words and pictures and add new bouquets for sale. I like to keep it active, which seems to encourage our customers to come back as they know they will see something new. The ability to easily make changes to a website is a key function all florists should look for when investing in a new site. For all florists, any investment needs to see a return. For Dolce Vita, as well as securing a huge volume of orders, costs are kept to a minimum too. There are no PDQ charges, no gateway charges and payment is received in three days via Barclays, in the process ensuring cash flow is no problem. Ande concludes by saying: “Our website really is going well and we’ll continue to refresh the site, add more products for sale and continue to share shop news. I’m delighted with the website, delighted with the support from Direct2florist and delighted with how easy the site is to work. I’m really happy and wouldn’t consider moving anywhere else.” Visit Dolce Vita Florist.